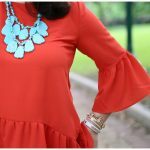 If you’ve been reading the blog for awhile, you know I’ve been obsessed with this necklace for several years. I always called it my “turquoise pendant”, but the official name was “azul stone pendant”. With just a quick glance through facebook, here are just a handful of the outfits I’ve worn it with over the last several years. 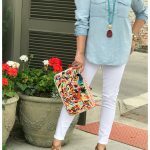 I actually wear it all year round (it looks great with a grey, cream, or black sweater and jeans), but I wear it most often in the spring and summer months with brighter and more vibrant colors! My friends at Accessory Concierge approached me with a fantastic idea. When I started wearing my “azul stone pendant” again this spring (for like the 3rd year in a row – or maybe it’s the 4th? ), they asked me if I would like to see the same necklace in some additional colors. So they made 4 new colors: hot pink, orange, green, and white! AND they are giving us a code!!! The code SIMS25 will give you 25% OFF, making the necklace $31.50 (regularly $42)! I wanted to start out the post with a flat lay showcasing all of the color choices. LOOK! HOW! FUN! You can’t tell me these necklaces won’t immediately spice up an outfit! I do want to mention here that the stones are natural stones, so there will be variance from stone to stone (which makes them even more beautiful). 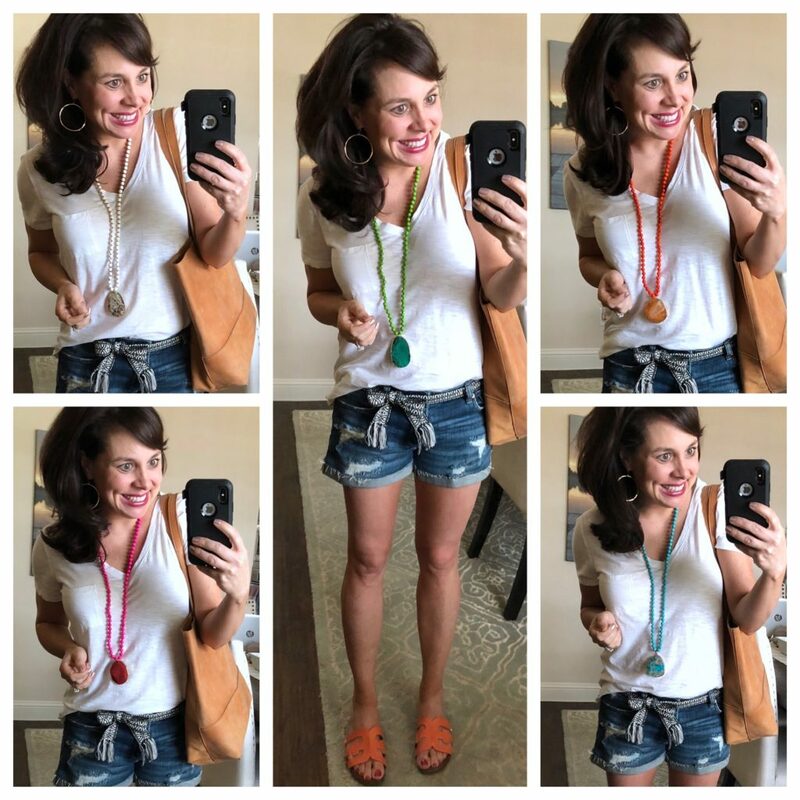 So here’s all colors of the necklace paired with my basic summer uniform: a tee, denim shorts, and sandals. 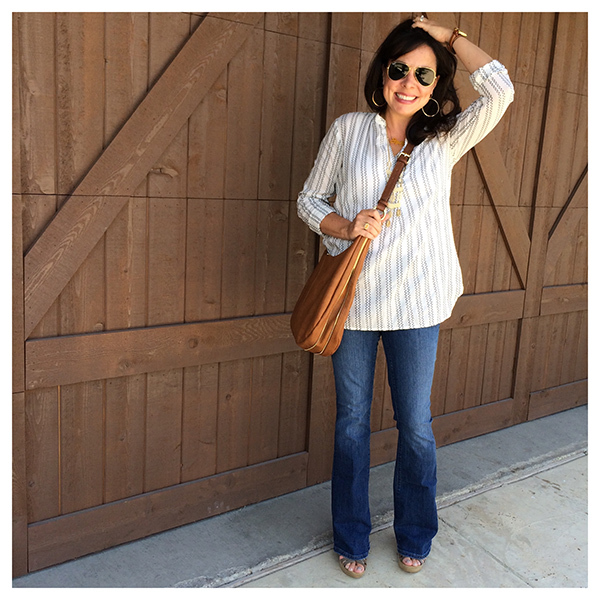 Now, today I’m wearing a white tee and orange sandals…..but this same look would work with pretty much any color or striped tee. And you could of course switch out the orange sandals for black, brown, or any color! Shoreline converse would also work! With this exact look, I think the green necklace is my favorite. I like the green with the black woven belt and the orange sandals! I sized up to a medium in the tee for a relaxed fit, I’m wearing my regular 27s in the shorts (but size down if in between), and the sandals are true to size. AND GIRLS! My favorite earrings EVER are ON SALE for 25% OFF! They come in gold, rose gold, and silver. These earrings are incredibly light and still make a statement. I’ve had them for around 4 years now, and I still wear them 3-4 times a week. YES. They are that good (and they only go on sale like once a year)! Lots of Gorjana stuff is on sale actually! I sized up to a medium in the sweater and really like the relaxed fit. However, I can still do a 1/2 tuck if I want to. I’m excited about all of the new necklace colors, but I think the white one is my favorite. 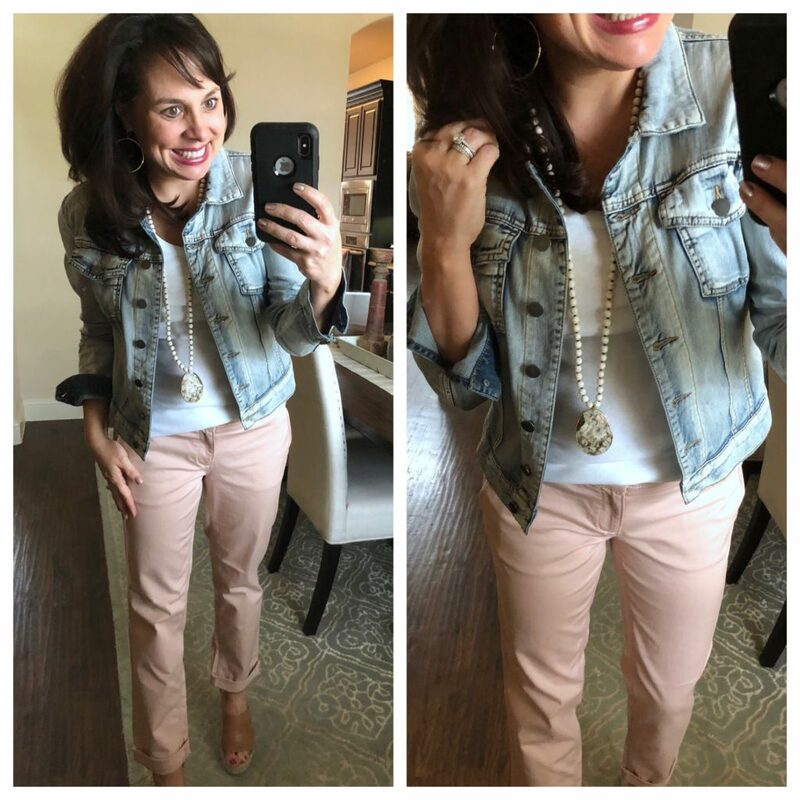 I’m wearing my favorite denim shorts in this next outfit, but click HERE for my denim shorts review last week where I review 3 pairs, including a much longer pair. You can also hop over to instatories (my ig handle is @sheaffertoldmeto) if you want to see videos of my reviews on my Instatories highlight reel! And here are the hot pink and turquoise necklaces with my favorite t-shirt dress from last year THAT IS BACK IN STOCK! I’m wearing a regular small in this dress, and I’m 5’4″. I’m wearing a medium in the jacket. The wedges are true to size. I have this same dress in a striped version from last year also, and I have it in a small petite. 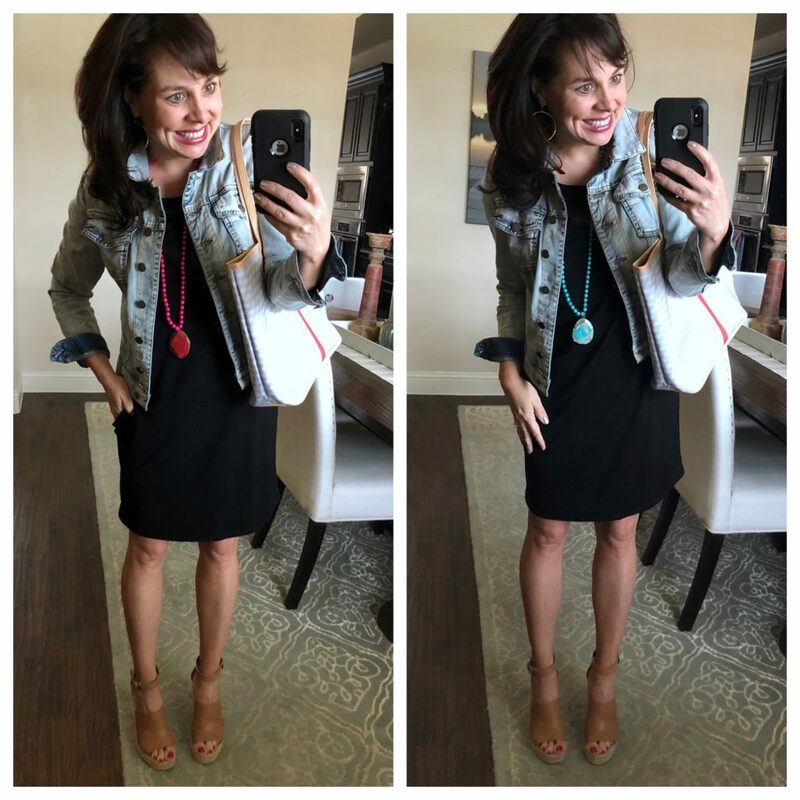 The petite is definitely shorter, so I only wear flat sandals or converse when wearing the petite dress. Here’s the white necklace again. And y’all. These girlfriend chinos are awesome (AND $25 OFF RIGHT NOW!). 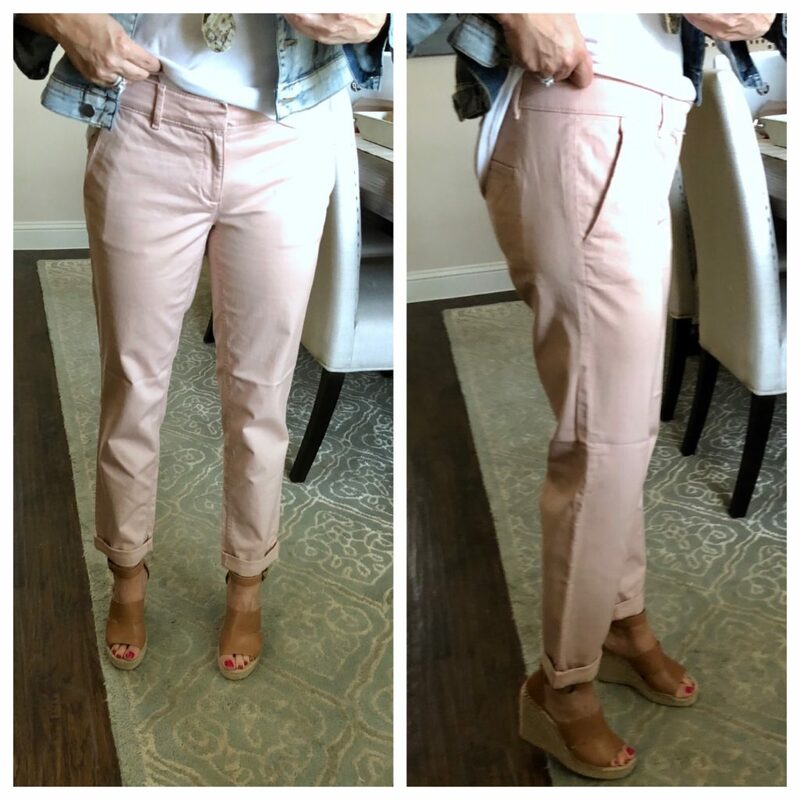 Mine are the “vintage blush”, and I’m super excited to have a pair of pants in my closet that aren’t jeans and aren’t slacks! I love them with my must have wedges, but they would also look great with flat sandals for a more casual vibe. So I’m wearing a 4 in the pants in this picture, but they are loose, so I’m actually going to try the 2s before I wear them. I hope you enjoyed all of today’s looks with the SIMS STONE necklace! Remember to use the code SIMS25 for 25% OFF this awesome necklace. Now that I’ve loved the turquoise one for years, I’m so excited to start incorporating these other colors into my outfits! Thank you Accessory Concierge!!! p.s. This is a totally random add on, but I had to let y’all know! The best strapless bra EVER is 40% OFF! I can’t recall if I’ve ever seen it go on sale, especially not 40% OFF!!! WooHoo!!!! And for you large chested women that are asking me about it, a reader just left this comment on facebook: I bought one last summer after reading your post. For a large chested woman I can tell you it’s the best!!!! I was comfortable in strapless and sundresses all summer because of this bra. Definitely snagging another one for this summer. Thank you so much for the input! The Sims Stone Necklace for $20!!! 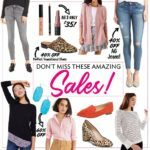 Friday Favorites – LOTS OF AMAZING SALE FINDS! Pinterest Told Me To Wear Orange, White, Denim, and Leopard…….Pinterest is So Dang Smart. Sheaffer! Oh my goodness! I want one of each! I got the same Loft pants and love them. However, the pockets are sewn together. I see pockets but am not sure I should cut apart. Did you cut them apart? I love having pockets. Thank you so much! I appreciate your help. Keep up the good work! I got this necklace when you first talked about it years ago, and it’s one of my favorites too, so I will definitely be getting another color. I get compliments on mine all the time. Trying to decide between the orange and the white! Thanks for the code! I have this necklace and turquoise, and I’ve given several as gifts! Now I need the white for myself! I think I need the white necklace!! Did you find the sandals were true to size? Hi Sheaffer! So sorry for not clarifying- I am looking at the brown ruffle ones! I am typically between an 8 and a 9 so I put an 8 1/2 in my cart. Wanted to see if you think that’s my best bet because the reviews were a little mixed! Hello! 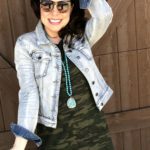 How exciting to have your very own necklace line – congrats!! Can you tell me if this necklace is heavy? The stone is large and so I’m worried that it will bother my neck. Thanks for all your great posts! Do we think that the necklace you are wearing with the sweater and shorts with the white bead is sold out??? Cant seem to find that combo on AC site. Hi! question about the must-have T&B wedges – I am so on the fence about them. Do you find your toes hang over the front a tad? I’m a size 6.5 and the wedges fit perfectly in that size except for the fact that my toes seem to stick out a bit. The 7’s are a bit too long in the length and the part that covers the top of the foot is too roomy. Not sure if anyone else had this problem with the wedges? Are my toes just super long or somethin’?! lol! They look so cute on though so I want them to work! Hi Megan! Hmmmm…my toes don’t hang over. Can anybody else comment on this?!? Sheaffer!!!! Congratulations! How’d I miss this post yesterday? Those necklaces are gorgeous! I have the turquoise and wear it all the time. About the TB wedges, my toes don’t have off the end either. Ok I have been following you forever and always lick up your must haves. It took me this long to get the jean jacket. What was I thinking? Well I have had a gap jean jacket since 2000 and my teenager swiped it so I bought the Helena last week and it’s RIDICULOUS!!!! I think i have worn it four times already this last week! You rock! 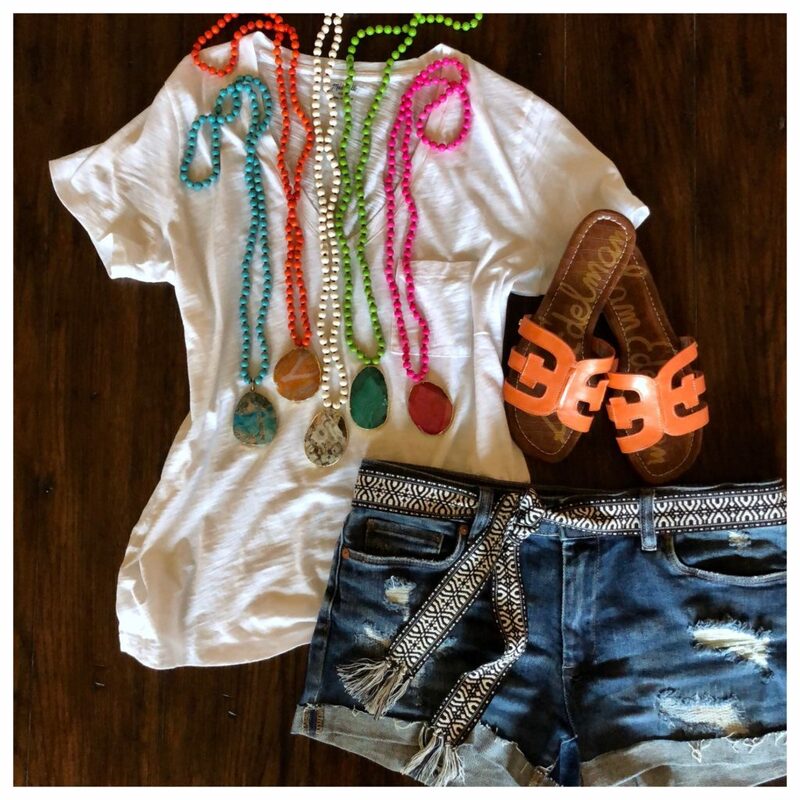 Must have wedges and the shorts are amazing too! Thanks girl!! I want that necklace in every single color! and I want my legs to look like yours in cut-off shorts!!!! That’s so awesome. Love those necklaces! 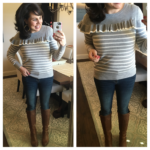 Keep up the great work, love reading your blog and your style!! Hi Sheaffer, I love that red gingham top with the turquoise necklace. Do you still wear the red gingham top? I might be able to snag that on eBay if you still recommend it. How did it wear/wash up? Was it see thru? So cute on you.